The Super Bowl provides the biggest stage to date for NFL analyst turned media darling Tony Romo, and the CBS Sports color commentator seems poised to maintain the success he has enjoyed during his first two seasons on the job and, especially, during the AFC Championship Game. Romo, the former Dallas Cowboys quarterback, has effortlessly moved into his position on the network’s No. 1 TV team with veteran Jim Nantz. He’s done so in a manner no one else has attempted. While analysts have traditionally found success by explaining what happened and why it happened after plays, Romo has gained notoriety by pretty much predicting the next play. It’s really not a trick, though. It’s just a quarterback fairly fresh out of the league looking at defenses and sharing a QB’s mindset before each snap. He checks coverages, discusses down and distance and offers insights into what a team might do next. When it works, it’s good stuff — so much so that some have joked that he’s been more accurate completing predictions than he was at completing passes when he played. Sometimes, though, Romo gets goaded into doing the what-comes-next thing more than he should, but that’s nit-picking. For the most part, he’s been , and he should be great working his first Super Bowl. Additionally, Romo’s genuine enthusiasm just sounds different on a broadcast. He’s happy and excitable, not unprofessional, but different from many in his role. Plus, that approach makes the typically buttoned-up Nantz better. CBS has more bells and whistles for this than a regular season game, but viewers will see those extra angles mostly on replays. For the most part the broadcast should look like any other — and if it does not that probably means the behind-the-scenes folks are relying too much on hand-held views or gratuitous graphics. With former official Gene Steratore in the booth, the network has a capable expert to discuss replays and rules. Like Romo, he was strong in the conference championship game and has been all season. Sometimes, though, Romo does not make enough room for Steratore to share his expertise. The former official, not the former quarterback, should be the voice who helps inform viewers about controversial plays. Beyond that, though, Romo should be the star of the show. He’s proven he’s up to the challenge. n Fans who listen on radio, and there are millions of them despite the attention the game gets on TV, will hear play-by-play man Kevin Harlan, who’s doing the game for the ninth year in a row. Hall of Fame quarterback Kurt Warner, who’s working his first Super Bowl, will be the analyst for the radio broadcast produced by Westwood One. n It’s pretty much an all-day pregame show for the Super Bowl on NFL Network, which can be compelling at times and overkill at others. Pregame programming on CBS begins at 11:30 a.m. with “That Other Pregame Show” while “The Super Bowl Today” begins at 2 p.m. The push to kickoff starts with “The Super Bowl on CBS Kickoff Show” at 6 p.m.
n Thirty-second TV commercials for the game this year cost $5 million. Expect the usual mix of advertisers — automobiles, beverages, Budweiser (with a just-OK dog, Clydesdales, environmental pitch), movies, snack foods, stars making cameos (Harrison Ford for Alexa from Amazon) and technology. n	We’ll see what happens with Penn State men’s basketball and coach Patrick Chambers but count me hopeful for some victories soon. Absent victories, those of us who check in on the program by radio or hear play-by-play man Steve Jones’ weekday talk show (on WMAJ-1450) get stuck with all manner of context that inevitably seems to sound like an excuse. We’re now at the point of the season when we hear about the lack of home games on weekends. That’s usually followed by laments about the different days of the week the team must play. Sure, both points are true. 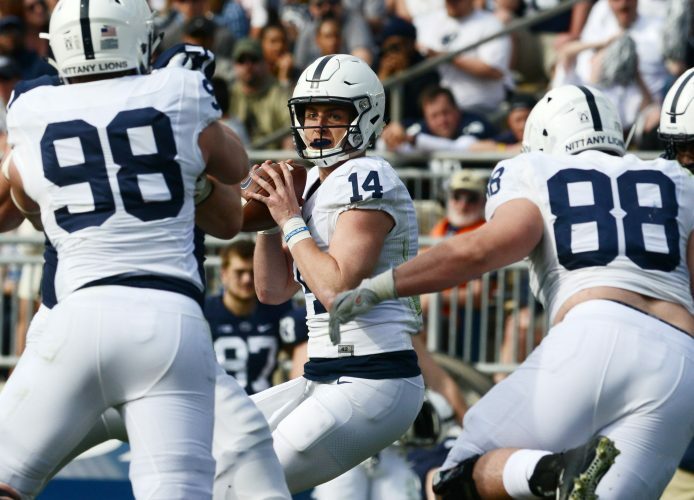 Penn State draws better on Saturdays, and TV contracts mean all teams play on more than just two specific days of the week anymore. Still, it just sounds silly when the team is simply not winning. Maybe they’re close, which is fine, acknowledge that, but the other ancillary things are a bit too much. n KDKA-TV in Pittsburgh fired an employee, Michael Telek, last week when he created an on-screen graphic for the station’s Monday afternoon newscasts that listed Patriots QB Tom Brady as “Known Cheater.” Telek, 27, told media outlets it was a “harmless joke,” but station officials felt otherwise. Plus, things like that do erode the credibility of an outlet and viewers should expect more professionalism from news organizations. n	The men’s basketball team plays Monday at Northwestern (8 p.m., Fox Sports 1) and Thursday at Ohio State (7 p.m., ESPN or ESPN2). n Both Penn State men’s hockey games this week against Minnesota will air on the Big Ten Network. That’s 6 p.m. Friday and again at 6 p.m. Saturday. Sampsell can be reached at stevesampsell@gmail.com.